One Saturday night, eleven years ago this night, I needed those helpers. I was home alone and I sustained a burst aneurysm in my brain; usually a fatal event. When an aneurysm — a bulging, weakening in the wall of an artery — ruptures, it leaks blood into the space around the brain. Things did not look good. The first miracle: At the moment it hit, I was on the phone. I was talking to my husband, Greg, who was over in the western part of the state, for a hockey tournament with my son. Greg was just passing the phone to my son, when he heard a slight gasp — the aneurysm hit and I lost consciousness. Not hearing any response from my end of the conversation, they thought the connection had been lost. Redialing. Busy signal. The second miracle: My high school daughter was out babysitting and came home early(!) I think the story was that the parents she was sitting for had decided (for some unexplained reason) to call it a short night. The third miracle: She had left her phone on the floor by the garage door. (Hidden under stuff?) I guess in those days a phone was not as important? The timing of events was about to get unbelievable. The fourth miracle: My daughter walked in at the instant my husband — continuing to get a busy signal when calling me — dialed her phone. The phone was ringing as she walked in and of course, she answered. I often think of what would have happened if a minute had passed between her entrance and his call. She (being a teenager) would not have looked for me (situated in the back office); she’d have headed straight upstairs. She would not have gotten the call. The next dreadful prediction was that I may never talk again… or have fine motor control or… and on and on. Each one gradually torpedoed. You all prayed. And here I am. This experience has taught me to believe in prayer! The miracles continued to come. Released from hospital after 6 and a half weeks. Friends and neighbors who decorated the Christmas tree for our family, drove kids, and brought meals. A dear friends who drove an hour just to get me outside for a short (very short in those first days home) walk! And the miracles continued. A friend who recognized my need for additional Physical Therapy and fought for me to get it! Another friend who took me with to one of his “stretching” sessions with Coach James Henry, and solved an aftereffect of surgery — deliberating pain in my toes! Eleven years in and I am still recovering and still receiving miracles. Praise be to God! 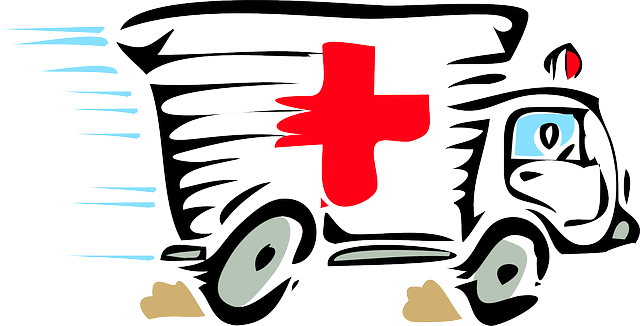 Moving ambulance by Clker-Free-Vector-Images, from Pixabay, and praying people,adapted from clipart by algotruneman. Both of these images are licensed under a Creative Commons Public Domain License. ← Are you encircled by an uplifting, nurturing, cloud of saints? So grateful for all these accumulated miracles — and for all the wonderful stuff you continue to do in this world. Thanks for sharing these amazing details.